The UT System Board of Regents Friday finalized a 15-year, $250 million contract between UT-Austin and Nike. The agreement with Nike is what is expected to be the richest shoe and apparel deal in college sports. The agreement was first reported by the Statesman earlier this month. The contract’s total value eclipses the University of Michigan’s 15-year deal with Nike this summer worth an estimated $169 million. At the time, it was widely hailed as the biggest deal in college sports. University of Texas Kevin Durant, Big 12 in scoring with an average of 24.7, walks off the court after scoring 17 against Texas Tech on Tuesday, February 20, 2007. 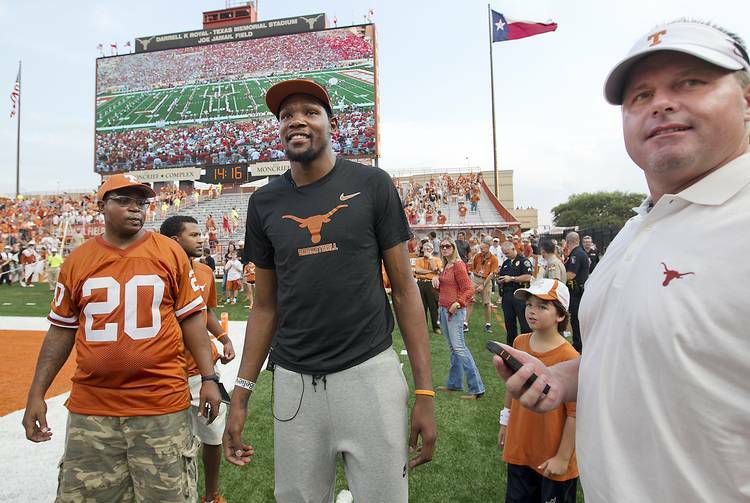 Creation of a line of apparel of “signature Kevin Durant-UT Austin line of performance products, apparel, and footwear for use by intercollegiate teams and for offering as NIKE and UT licensed retail product.’ The former Texas basketball star currently has his own line of basketball shoes through Nike.